When you are in your golden years, it is very important to pay attention to your health. Besides the obvious benefits of maintaining your health, it becomes increasingly crucial due to the fact that many aspects of your health will diminish over time. Your metabolism will slow down, your immune system will diminish, and your eyesight may falter. And these are only on the tip of the iceberg. However, these are issues that can be slowed down and even stopped through a healthy lifestyle and a nutritious diet. Boosted Immune System: One of the main reasons why a healthy diet is so important is because of your immune system. With age, the immune system will become weaker and weaker. This will make it easier for you to fall ill to even the most common conditions on a regular basis. By eating right, you can maintain and improve your immune system. This will not only protect you from common illnesses but it can help prevent more serious and life-threatening conditions as well. Faster Metabolism: Another reason why you will want to maintain a nutritious diet is for your metabolism. One of the first things that becomes affected by age is the metabolism. The older you get, the slower it will become. This will make it easier for you to gain weight, it can cause fatigue, and it will reduce the body’s ability to process food. Maintaining a regular nutritious diet can help improve your metabolism for a healthier and more energetic lifestyle. Better Health: The main reason why you will want to improve your diet is for your health. It will not only improve your immune system and metabolism but it will also enhance nearly every aspect of your health. Food can reduce wrinkles, improve hair, enhance eyesight, boost your energy, and much more. Those are just a few of the many advantages that you can enjoy at an advanced age by improving your diet. 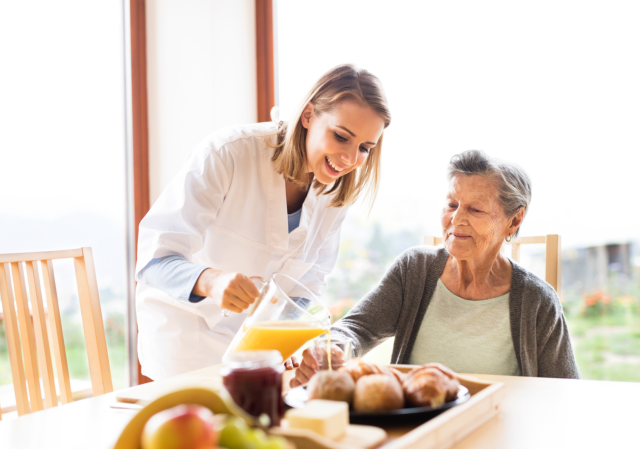 If you would like to find out more about how your diet can help you or about our personalized care services, please feel free to get in touch with Lowenhill Home Care Services anytime.